The Korean Housing Association (KHA) was established in 1989 with an aim to the academic development on housing studies in Korea. The KHA has 1700 members and has been participating various academic activities and conducting housing researches relating to architecture, urban planning, residential culture, surrounding environments. The KHA has been growing steadily based on the internal stability. 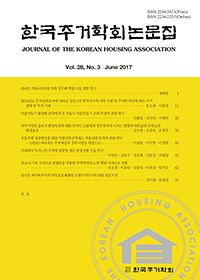 Journal of the Korean Housing Association was certified as one of A grade registered journals in 2004 by Korean Research Foundation (currently, the National Research Foundation of Korea). The KHA has regular symposiums and academic seminars in spring and autumn, further has held international conferences and international exchanges such as an academic exchange agreement with Association of Urban Housing Sciences of Japan through academic exchange agreements. The members of the KHA have participated in establishing major public policies through the cooperation with public and local governments such as the Ministry of Land, Transport and Maritime Affairs and the Korea Land and Housing Corporation. In addition, through the collaboration with construction and design companies, the KHA has laid solid foundation for the research into residential living and environments as one of representative institutes in Korea.